Cabrito, goat by any other name, the other red meat. In the last couple of years, because of the efforts of a family member, we have become aware that most of the world eats goat (Cabrito). America does not consume much goat but it seems almost everybody else does. Indian cultures eat goat, Jamaicans eat goat, Spaniards eat goat, goat is eaten all over Mexico, Africa, most anywhere. As a matter of fact cows were brought to the Americas by the Spaniards (around 1521). Before that, they probably ate goat. We decided to buy some Cabrito and find out for ourselves. We found two very nice Cabrito steaks at our favorite Mexican Market. The steaks had the look of beef but leaner, more red and smaller. it was not cheap. To prepare the meat we rubbed it in soft butter and then generous proportions of Knox's Jamaican Jerk BBQ dry rub. They where baked until the meat thermometer registered medium rare for lamb. Our meat thermometer does not have a setting for goat. They cooked up rather nicely. It tasted like beef but different. We liked it very much although next time I think we will try a curry or maybe smoked. Although unfamiliar to our pallets goat has an excellent taste and texture. If that is not enough to get you to go out and purchase some Cabrito for the BBQ, it is also good for you. Goat has less saturated fat as chicken. Goat has more iron than all of them (http://www.triquestboergoats.com/cabrito.htm). Once I knew this, Cabrito seemed to be more like a super food treat than exotic meat. Next time we taste test a Cabrito recipe we will make sure to post it. I look forward to grilling season with our new found Cabrito. 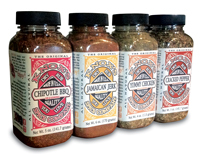 Maybe we will try some Cabrito burgers blended with Knox's Chipotle BBQ rub. YUMMM!